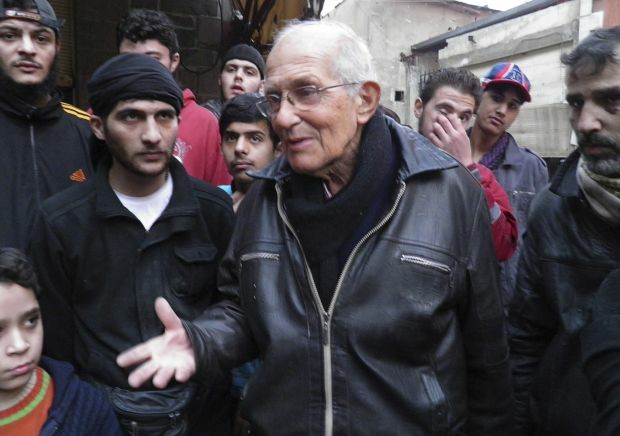 Jesuit Father Frans van der Lugt “arrived in Syria about 50 years ago” and “always did his best for everyone with graciousness and love, and so was loved and held in esteem by Christians and Muslims,” the pope said April 9 at the end of his weekly general audience. Father Van der Lugt had refused to leave war-torn Syria, instead staying in Homs to help the poor and homeless. He was beaten by unidentified armed men and killed April 7 with two bullets to the head, according to the Jesuits’ Middle East province. Father Van der Lugt, a psychotherapist, had worked in Syria since 1966 and had been offering shelter in his monastery to Muslims and Christians left homeless by the war, which began in March 2011. Father Van der Lugt became known around the world after appealing for aid for the people of the besieged city of Homs in a video posted on YouTube in late January. The United Nations supervised an evacuation of about 1,400 people from Homs in early February; arriving in Jordan, the refugees confirmed Father Van der Lugt’s accounts of people, especially young children, starving to death. In Syria, Jesuit Refugee Service announced it would close for three days after Father Van der Lugt’s death. “Father Frans was a beacon for all of us; he did not only preach about love and reconciliation but he lived it out every day — in humility and with compassion for all — until the very end,” said Father Peter Balleis, JRS International director.